During persecution of Christians in the former Soviet Union, 3 pastors organized a conference for Russian Christian young adults. In spite of the personal risk, 700 of them met in Moscow. None of these young adults owned a bible, but the leaders wanted to challenge and test their memory of scripture and worship music. Each day that week they had the youth gather in small groups and try to recreate what they could from memory. At the end of the conference, when they compared and combined the efforts of all the different small groups, the young people had recreated all of Matthew, Mark, Luke, and John with only 6 mistakes. They had also recreated the lyrics of more than 1200 songs, choruses, and hymns of the faith from memory. After the conference, the 3 pastors were sent to prison. They said it was worth it (Chapter 20 of The Insanity of God). But scripture memory does not have to be in large chunks. My parents have really enjoyed using the Topical Memory System, which has key verses on flashcards and helps a person build their scripture memory topically, one verse at a time. 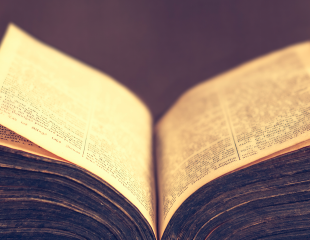 Memorizing the bible isn’t just some human idea, scripture itself talks about it. Psalm 119:11 says “I have hidden your word in my heart that I might not sin against you.” And some Psalms are written acrostically (in the original Hebrew) in order to aid memorization. Christ says in John 15:7 “If you abide in me, and my words abide in you, ask whatever you wish, and it will be done for you.” This is not a magic formula, but a description of the kind of prayer life we’ll have when our minds and hearts are treasuring up God’s word. So, brothers and sisters, “Let the word of God dwell in you richly…” (Col 3:16)! For benefits of scripture memory, here is part 1 of a 5 part series. Click here for 14 reasons to memorize an entire book of the bible. Click here for 11 tips on memorizing an entire book of the bible. help you share your faith with someone (for example, some of you will be learning the One Verse Gospel method in a 3 week workshop starting next week). Christos Community Church will buy you a bible of your choosing (up to $50 value) when you say from memory a chapter or single passage of at least 20 verses in length, on 3 separate Sundays. Because the 3 keys to successful scripture memorization are ‘review, review, and review’, the standard for success is not just being able to remember the chapter or verses one time (anyone can ‘cram’ for a test). But on 3 separate Sundays (they do not have to be consecutive). We know that is a challenge. But we believe you’re up for it. If you embark on this goal, we can help you get there by meeting periodically after the Sunday worship service (dates to be published later). During that time we’ll hear what each other is working on & learn scientifically proven methods of memory work that can be adapted for different learning styles and preferences. Even if you don’t opt for a chapter-sized amount of scripture, we’d love to have you join us to help us review, to encourage us, or to have someone listen as you (or your child) recite your most recent memory verse. Because we’re not alone… our C3 Kids will be focusing on Scripture Memory in 2016 in their Sunday School classes (ages 3-14)!